Chia seeds are the fruit of Salvia hispanica, a plant native to Central and South America. In addition to serving as food and medicine, the ancient Aztecs valued the seeds so much that they were used as currency. Today, the seeds are reputed to promote weight loss and reduce the risk of heart disease and cancer. However, there are potential negative health effects to discuss with your doctor before adding chia seeds to your diet. The reason chia seeds are thought to facilitate weight loss is because they are an abundant source of soluble fiber. As such, they possess hydrophilic properties, meaning they readily absorb water. In fact, chia seeds absorb up to 12 times their volume when introduced to water. 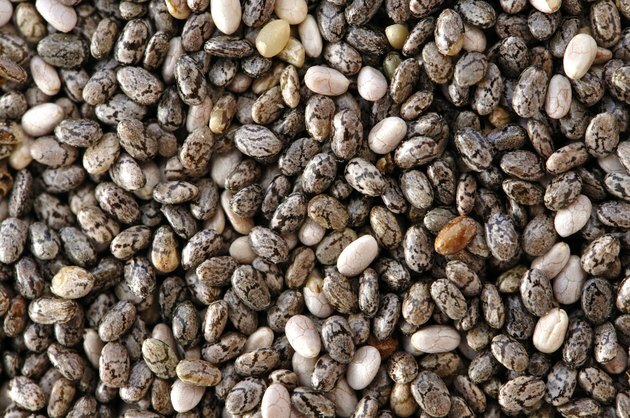 By adding the seeds to cooked food, they add bulk without adding additional calories or fats. So, in theory, the seeds act as an appetite suppressant by the virtue of being filling. The seeds also form a thick gel when added to water, which may be used in place of fats when cooking or baking. In addition, the fiber content helps to increase the transit time in the gastrointestinal tract. There is no clinical evidence to back up the claim that chia seeds promote weight loss. In fact, a team of researchers from the Appalachian State University in North Carolina reported in the June 29, 2009 issue of “Nutrition Research" that chia seed supplementation showed no more weight loss benefits in 90 overweight adults after 12 weeks than those receiving a placebo. There is also the possibility that consuming large quantities of chia seeds may cause bloating or interfere with the absorption of nutrients. The Sloan-Kettering Cancer Center cites a study that showed that chia seed supplementation significantly reduced several risk factors for cardiovascular disease in 20 subjects with Type II diabetes. Effects included decreased blood pressure and fibrinogen and C-reactive protein levels. However, the center also states that these results indicate that chia seeds may increase the effects of medications to lower blood pressure. If you are currently taking anti-hypertensive drugs, or have other risks for heart disease, please consult with a qualified health care practitioner before using this dietary supplement. The Sloan-Kettering Cancer Center also says that clinical studies have shown that compounds in chia seeds may help to regulate serum glucose levels. However, as with heart medications, chia seeds may increase the activity of drugs designed to control blood sugar. Talk to your physician about the use of chia seeds in your diet if you have a history of diabetes.